If you were subscribed to the show (on iTunes, Feedly, Feedburner, or Google Play Music) or following us socially (on Twitter or Facebook) during that initial run, you’re likely either sick of us or jonesing for the next fix. See, we got pretty excited when the show went public and wanted to get the first couple of sans-Jake episodes (“Delirious” and “The Amityville Horror”) live before his glorious arrival for “Shaq Fu”. Things escalated pretty quickly into our fourth episode. In the interest of keeping things regular around The Dust Off headquarters, we’ve settled on a scheduled weekly release. From now on, check your podcast app of choice every Friday morning (don’t fret, we’ll be there in time for your pre-commute downloading) for a brand new episode of The Dust Off. We’re stoked to now be a regular (and reliable) part of your week. If you’re happy to have us there, don’t forget to subscribe, rate, and review us on your podcast app of choice — especially if that app is iTunes, since they appear to rule the world. Not to sound like a dusty old broken record, but that feedback really helps us with rankings and brings in more awesome listeners. In the meantime, check out our look at “That 70’s Show” (spoiler: we all loved it) in the days leading up to our go-round with DEVO! 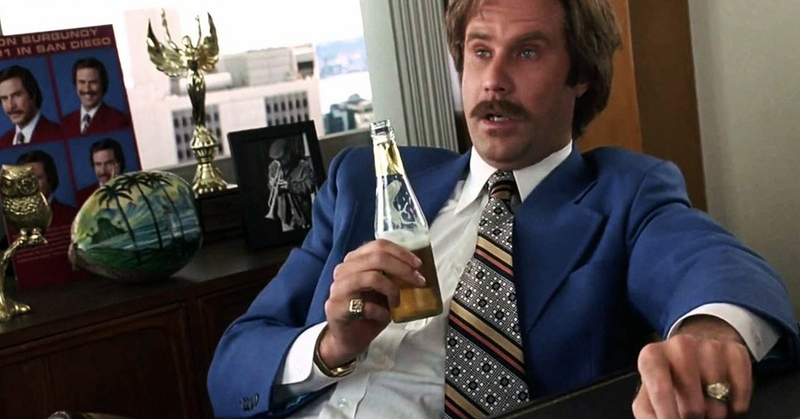 Featured image originally from “Anchorman: The Legend of Ron Burgundy” (2004).